If there’s one promoter in London I can point to as ‘doing it right’, it’s Chaos Theory Music. The eclectic gig promotions company, which covers the range from extreme metal to avant-garde electronica, consistently puts on some of the best shows that London has to offer. Their monthly Facemelter event is quickly becoming an incredible popular event. The monthly concert draws together three bands who may not necessarily share musical similarities, but can all be comfortably seen under the same roof. This evening, the roof was broadly speaking ‘post-rock’, featuring three bands who in some way could be considered to fall under this umbrella: Kontakte, Dresda and Rumour Cubes. But, as we’ll soon find out, post-rock’s boundaries are very inclusive. First up are London’s Kontakte. A duo wielding a bass and guitar between them, and with an array of electronic equipment surrounding them, their sound is certainly post-something-or-other, although firmly entrenched in electronic genres. Starting off on a mellow note, it’s not long before glitchy beats stop and start under a wash of post-rock-flavored guitar noise, with neither bassist nor guitarist shying away from rocking out. There’s an array of emotions emerging from their set; in turns euphoric and introspective, the songs twist around thundering programmed drums and effects-laden melodies. The sound never lets up, and even between songs there is a low hum of ambient drone. Their half hour is an intense ride, but the audience emerge out the other side significantly better for it, and Kontakte set the mood perfectly for the evening. Next up are Italians Dresda, who drove an incredibly long way for this tour and compensate with a stunning set of shoegazing post-rock. Their songs flow together beautifully in a well-rehearsed set, juxtaposing groove with fragile melodies. On several occasions it’s hard not to be swept up in the emotional potency of it, reflecting on the images conjured by their music. Having three guitars could easily have muddied the sound in the tiny upstairs room, but in this case the guitarists interwove marvelously, leaving the bassist to feel out the lower frequencies, and when the band kick in together it is gloriously harmonious. The story of Dresda’s trials and tribulations through the UK is an unspoken saga, but the culmination in this London date makes all the energy expended worth it. 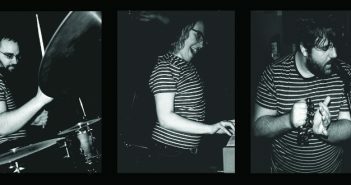 And finally, the headliners for the evening are London’s very own Rumour Cubes. It’s tough to pick out a frontperson in a post-rock band, but violinist Hannah Morgan is the affable and chatty leader tonight, despite the entire band sweating under the bright lights and lack of ventilation. 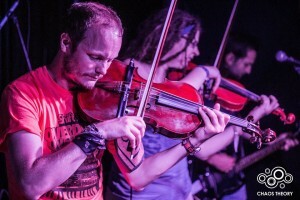 Musically the band are stunning, unveiling their signature take on violin-driven post-rock. Flowing beautifully between “Seven Year Glitch” and “Hiyat”, Rumour Cubes continues the evening’s theme of stunning imagery summoned by the music. It’s a little crowded onstage with the six of them and their equipment, so movement is minimal, but the band bob and sway through their set lost in a trance. The song titles are rarely spoken, but the crowd are familiar with both albums. The one-two of “Rain On Titan” and “Triptych”, presented in order on the album, is a phenomenal ending to their set and the evening, the entire crowd dancing along with the band despite sweat dripping off everyone’s faces, smiles all round. I’ve been a strong proponent of Chaos Theory for some time now, and their Facemelter concerts are but one stunning facet of what these promoters do in London. The consistently phenomenal quality in the bands they book, like the ones tonight, is almost unparalleled in London, no mean feat for a city that can offer upwards of fifty concerts per night. If you are London-based, or even just passing through, and want an excellent music-related night out, get yourself to Chaos Theory. The next Facemelter is tomorrow. Video credit: Thanks to Peter Junge and Chaos Theory Music.